I haven’t really ventured into sharing any type of recipe on this blog yet, because I assume that all those visiting have read through the main website (wishful thinking) or are pros. So in order to stop embarrassing myself and having a barrage of criticism, which would be good for raising the profile of my blog, I’ve avoided this, of course until now, so I’m taking the plunge from this day forth…. wish me luck. In most cafes, whenever you get served a cappuccino there is always a tendency to sprinkle chocolate powder on top of an exaggerated dense air foam. However, in the top cafes, where they know what they are doing, they avoid these type of gimmicks and just give you the real stuff, espresso and well frothed milk, without heaps of foam. So one day I was thinking, if I had a cafe (one of my dreams) and wanted my customers to still get their kick of chocolate sprinkled cappuccino, how would I serve it. This may not be original, but then I thought, “I wonder if I sprinkle some chocolate powder on top of my espresso before I poured my micro-foam frothed milk on top” and so that is exactly what I did last Sunday, so here is what I call “New Age Cappy“. 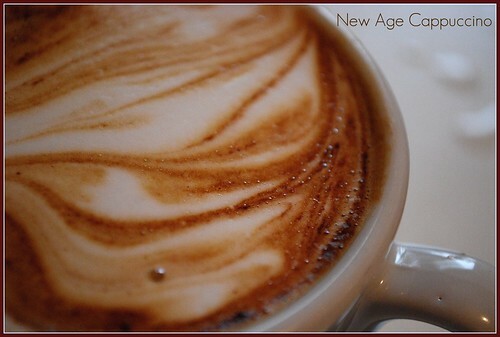 New Age because it relates to serving coffee well and Cappy, well as a short trendy name for Cappuccino of course. 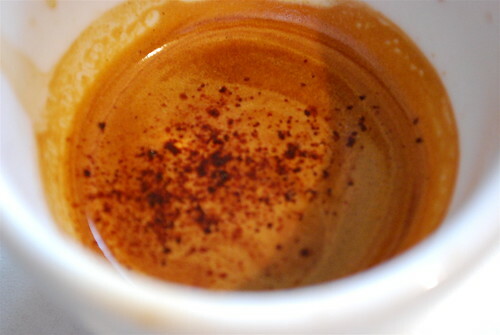 Step One: Make sure you extract a thick crema espresso, because when you sprinkle the hot chocolate powder on top, it will have to sit quite comfortable on top without a threat of falling through the crema cloud to the bottom of the cup. Step Two: Froth your milk properly so that you have micro-foam qualities if not as soon as you pour the frothed milk on top, it will just move the chocolate powder away to the side of the cup with no real design to impress your friends…. hmmm ! Again, I am assuming that you have been practising milk frothing techniques for over two years like me or are a trained pro. Step Three: Pour the frothed milk into the cup, tilting the cup slightly and making sure the beginning of the pour goes below the crema cloud, before finishing off over the top. I can’t show a picture of this, as I only have two hands and didn’t trust my daughter with my $750 camera, but I plan to do a short video on this God willing sometime in the future. What you should get in any case at the end, is nicely poured cappuccino but with the chocolate sprinkles sitting on top, meshed into the coffee and the frothed milk, so that every sip will end up being unique no less. The final version should look like the picture at the top, but just to give you a closer look, see this one up close and personal. You see, it wasn’t that difficult after all. I don’t have a patent on this, but if you try this after reading my blog, think of me and tell your customers about my blog – that will do. Ciao and have nice weekend. 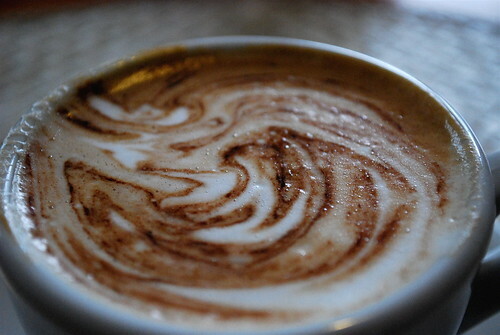 This entry was posted on Friday, February 6th, 2009 at 12:48 am	and tagged with Cappuccino, Chocolate, New Age and posted in Coffee Recipes, The Art of Coffee. You can follow any responses to this entry through the RSS 2.0 feed.